Keep Billingshurst Frack Free held a successful, well-attended public meeting at the Billinghurst Community Centre, last Friday 10th April, where many local residents shared their concerns over the potential fracking site at Broadford Bridge. Some even expressed worries that most people in the area don’t even know about the site and what it’s likely to be used for. A packed hall heard presentations from Friends of the Earth, the Sussex Wildlife Trust and local residents, after which there was a lively Q&A session with most attendees staying afterwards to find out what else they can do to help the campaign to Keep Billingshurst Frack Free. "We were very pleased to see so many people come along - there is a definite need to know more about this site. We will be doing our best to gather and share all the relevant information, and look forward to having more people on the team to help us Keep Billingshurst Frack Free." "All of the speakers pointed out the need to keep fossil fuels in the ground if we want to avoid damaging climate change. Fracking companies such as Celtique Energie are more interested in profit than local communities." Celtique Energie has permission to test drill for oil or gas at a site in Adversane Lane – between Billingshurst and Pulborough. The company has cleared the site and the well is set to be drilled this spring. Being an exploratory well, no fracking will take place at this stage, but if oil or gas is discovered it could do in the future. Anyone else wanting more information about the campaign can join the Keep Billingshurst Frack Free group on Facebook. 1. The well at Woodbarn Farm (Adversane Lane, Broadford Bridge, Billingshurst, West Sussex RH14 9ED). was granted planning permission by West Sussex County Council in February 2013. 3. Celtique Energie have been refused planning permission to explore for oil near Wisborough Green (due to the impact of traffic) and Fernhurst, within the South Downs National Park. A group of Billingshurst mums gave up their usual Mother’s Day celebrations to launch the Keep Billinghurst Frack Free campaign, at the Women’s Hall on the High Street. Around 30 people, including local actress Sue Jameson and award-winning human rights activist Nicola Peel, from Pulborough, gathered to share information about fracking, and make banners to take to the site, to raise awareness of what’s happening just outside the village. Despite recent jubilation in nearby villages Wisborough Green, Kirdford and Fernhurst, after Celtique Energie decided not to go ahead with plans to test drill, their site on Adversane Lane, between Billingshurst and Pulborough, could see exploratory drilling start as early as next month. Celtique Energie has permission to test drill for oil or gas at the site. Being an exploratory well, no fracking will take place at this stage, but if oil or gas is discovered it could do in the future. Hydraulic fracturing of the earth by injecting at high pressure millions of litres of fresh water, mixed with various hazardous chemicals, to release oil and gas from deep underground, is a highly controversial method of drilling for unconventional fossil fuels. Many people who came to the Mothers’ Meeting didn’t know much about fracking when they arrived, but joined in the banner making after seeing videos of the site, and of the so-called ‘Gold Standard’ industry safety regulations at another site at Barton Moss, Manchester. Here lorries were filmed dripping hazardous chemicals onto roads where children walked to school, and pipes were held together with screwdrivers and rubber gloves. After the success of this Sunday’s meeting, Keep Billinghurst Frack Free are holding another public meeting with speakers and films at the Community Centre on Friday 10th April, and further events to help the local public find out more about what’s happening just outside their village that could affect their children and grandchildren. Alarming news from the wonderful Ruth Hayhurst at drillordrop.com : in the final version of the Infrastructure Bill the definition of a 'frack' has been rewritten - it now only applies to fracturing operations that use 10,000 cubic metres of water or more. Anything less is not covered by the (already weak) regulation. Balcombe residents calculated that 10,000 cubic metres is equivalent to 333 of the largest tankers allowed on British roads. This would only be to transport water to the site - another estimated 167 would be required to take the wastewater away. More details can be found in the article here. At the 11th hour, the House of Lords and MPs weakened the fracking regulation section of the Infrastructure Bill, going back on the Government's promise to ban fracking totally from National Parks only a week before. The final version of the Infrastructure Bill does not afford strong protections to National Parks, AONBs or Water Source Protection Zones. Sussex, and large areas of the country in these zones are not safe from fracking development. Articles in more detail can be found here and here. Fracking is still nominally banned in National Parks and Groundwater Source Protection Areas, but a sneaky bit of legislation leaves it up to the Secretary of State to 'decide' what the definitions of these areas are after the General Election. Another clause says 'consent for fracking may be issued subject to any conditions which the Secretary of State thinks appropriate' (emphasis added). This means local planning decisions can be delegated to the Secretary of State. This doesn't bolster our confidence, particularly as it's clear that both the major parties are pro-fracking. Labour have shown their hand with the Infrastructure Bill : most of their MPs abstained from a vote on a moratorium, they proposed deliberately vague regulations instead of calling for a proper MPs debate of the changes to trespass laws, and when those regulations were weakened they did nothing, bar faint protests, to defend them. It seems as though (bar a few brave non-whipped MPs,) they never really planned to object to fracking. These paper regulations allow them to say they are the 'alternative' and 'for the people', but are in fact as pro-shale as they come. Bans fracking at depths of less than 1000m, but the Secretary of State can override this. If it wasn't clear before, this shows for definite that the only safe fracking is no fracking. Regulations can always be weakened. Last week was a big week of news for fracking. It looked at some points as though the UK could get a total moratorium, but this was overturned, and instead, laws allowing fracking companies to drill and dump substances under land without permission were passed. There were some wins however. In the lead up to the 26th January, when the Infrastructure Bill came to the House of Commons for MPs to debate and vote on amendments to the Bill, there were growing calls from some MPs for a moratorium on fracking. On Monday morning, the Environmental Audit Committee (EAC) produced their report on the Environmental Risks of Fracking, which called for a moratorium on fracking, saying it's not compatible with the UK's climate change targets and had 'significant environmental risks'. Four to five hundred people attended the rally against fracking outside Westminster and cheered the inspirational speakers loudly. Many thanks to all who came or sent messages of support. This great video of the rally gives you a flavor if you weren’t there. The vote on the moratorium was defeated 308 votes to 52, after most Labour MPs abstained. The important clauses allowing fracking companies to drill under land without permission were passed without the opportunity to debate them, which is disgraceful given that 367,000+ people have signed a petition against them, and 99% of respondents to the consultation on the Bill were opposed to them. Instead two other things happened: the Energy Minister, Amber Rudd, announced that there will be 'an outright ban on fracking in National Parks and AONBs' and a new clause proposed by Labour was accepted. This lays out 13 regulations on fracking, including 12 month baseline monitoring, mandatory Environmental Impact Assessments and banning it from 'Protected Areas', near aquifers or at less than 1,000m below ground. We should definitely take heart from this that mounting public opposition is working! Some good chunks of the South East, including the South Downs National Park and the High Weald Area of Outstanding Natural Beauty (AONB) would be safe from unconventional exploration if this becomes law. But it still leaves many “out in the cold” for example Celtique’s site at Wisborough Green is just 500 metres from the National Park, and the Billingshurst site is not in a protected area either. At Balcombe there are still concerns because despite being in an AONB they could still see conventional drilling with processes that aren’t wanted near the village. This article sums things up. The exploratory oil well planned for Broadford Bridge, near Billingshurst in West Sussex, is likely be drilled in spring 2015, according to information for investors. The cost of drilling is estimated at $5m (£3.17m) and, under a deal with the UK government, the well would secure the future of two license areas for the operators. The well is expected to explore for conventional hydrocarbons but possibly also what are described as “other potentially productive formations”. The information is in annual and quarterly reports issued by the American company, Magellan Petroleum, for the United States Securities and Exchange Commission. Magellan is a partner of Celtique Energie, the operator of the Broadford Bridge site. In its report for the three months ending September 30th 2014, Magellan said it had been working with Celtique on plans to spud [the process of beginning to drill] what it called the Broadford Bridge-1 well. The company confirmed this would be the first exploratory well to be drilled in its central weald licenses. The quarterly report said the process of obtaining regulatory and planning permissions was “substantially complete”. It added: “Spudding of the well is now planned for the second quarter of calendar year 2015”. This is later than originally planned, the quarterly report stated. It blamed “weather-related concerns” for the delay. The company’s annual report for its last financial year had said drilling would start in the autumn or winter 2014. The annual report also stated the cost of the Broadford Bridge-1 well was “currently estimated to be approximately $5.0 million”. According to the quarterly report, the cost to Magellan was $1.82m (about £1.16m). Magellan said it may fund this from its existing cash balances but it was also “considering a potential partial or full farmout transaction”. This suggests Magellan may sell part or all of its interest in Broadford Bridge-1 to another company. The quarterly report also confirmed the well would explore for conventional, and possibly unconventional, hydrocarbons. “The Broadford Bridge-1 well is designed and permitted to test a conventional prospect in a Triassic-age formation. Celtique may also collect logs and cores, where appropriate, from other potentially productive formations”. “A complete suite of logs and cores is planned to be collected from the Kimmeridge Clay and Liassic formations, which we believe will provide certain technical data, including thickness, oil maturity, formation pressure, and rock brittleness, to be able to assess the potential for unconventional development of these formations and in turn possibly attract partners to continue the development of theses licenses”. The Broadford Bridge site, at Wood Barn Farm, Adversane Lane, is in the licence area PEDL 234. This is one of three licence areas Magellan co-owns with Celtique Energie, amounting to about 124,000 acres. The other licence areas are PEDL 231 and 243. All three areas have drill or drop clauses which require the operators to drill an exploratory well by June 30th 2016 or lose the licence. According to the quarterly report, the Department for Energy and Climate Change has agreed that the well drilled at Broadford Bridge would satisfy the drill or drop clauses for both PEDL 234 and 243. If the well were drilled, this would allow these licenses to be extended for another three years. Magellan also said it had been continuing to try to get permission for “additional drilling locations” within its central weald licenses. It said it expected this would allow it to meet its drilling obligations for the other licence area by the June 2016 deadline. The quarterly report also highlighted another connection between Magellan and Celtique Energie. In the notes of the accounts, Magellan said it had paid $40,000 to Devises International Consulting Ltd for consultancy services during the three months ended September 30, 2014. Devizes International was formed in 2013 by geologist, Christopher Pullan, a director of Celtique Energie and, according to Bloomberg Business Week, one of its founders. Two Sussex MPs have tabled amendments to remove clauses relating to fracking in the Infrastructure Bill. THIS IS VERY IMPORTANT... if the clauses are removed fracking will be forced to stall in the UK. The MPs are wanting to see... the removal of the clause which would make it a legal duty to 'maximise the economic recovery of UK oil and gas', together with the removal of the clause to change trespass law, allowing companies to drill beneath our homes and land without our permission and to leave 'any substance or infrastructure in the land'. Please URGENTLY write to/ phone/ meet your MPs asking them to support the two amendments to the Bill. FFBRA’s claim for Judicial Review was rejected this morning in the High Court by Mr Justice Gilbart. We are obviously disappointed. We, along with lawyers Leigh Day, believe the judge did not address our key arguments. Nevertheless, bringing our case to the High Court was a victory in itself, and has raised important issues. Councillors in West Sussex (and throughout the two-thirds of the UK at risk from exploration for unconventional oil and gas) will in future be forced to take applications from oil and gas companies more seriously. We believe this will make for more informed planning decisions in the future. Judicial Review revolves around criticism of procedure, in our case the way the council considered Cuadrilla’s application, the importance attributed to certain issues, and our belief that councillors on the planning committee were misadvised by the Planning Officer and lawyers for the council. It did not and could not address the rights and wrongs of exploration for oil in our village. A group of Balcombe residents has lost its High Court battle to overturn the planning permission granted to Cuadrilla to test an exploratory oil well in their village. At a judicial review hearing four weeks ago, the Frack Free Balcombe Residents Association argued that the permission was unlawful and should be quashed. They said officers at West Sussex County Council’s had misdirected the planning committee about the issues it must consider when making the decision. Mr Justice Gilbert rejected the residents’ case and said the planning permission was valid. He awarded costs of £10,000 against Frack Free Balcombe Residents Association. Costs to the council arising from crime and disorder if the application were approved. West Sussex County Council argued that it had followed government planning guidance. It said it should not duplicate the work of other organisations or substitute its judgement for theirs. Fracking risk compared to thalidomide and asbestos by UK Govt's Chief Scientist. “History presents plenty of examples of innovation trajectories that later proved to be problematic — for instance involving asbestos, benzene, thalidomide, dioxins, lead in petrol, tobacco, many pesticides, mercury, chlorine and endocrine-disrupting compounds..."
The chapter, written by Prof Andrew Stirling of the University of Sussex, also argues that the UK and the world could tackle climate change with energy efficiency and renewable energy alone but vested interests in the fossil fuel industry stand in the way. An important peer-reviewed letter about fracking has appeared in Nature, the world’s foremost scientific journal. It says that global CO2 emissions are likely to be worse with fracking. This is useful to use with your MP or others who argue that fracking for gas or oil is “green” because it will be a bridging fuel before low carbon energy sources kick in. The scientists look at 5 different models to determine effects on climate change. - This would drive gas prices down. Because the gas would be cheap, it would be unlikely to displace coal, and simply be burned in addition to coal that is already used. The full article is available on request. Guardian summary here and Climate News here. IGas have announced that they plan to drill two new wells in West Sussex, one at Graffham near Midhurst and the other at West Dean near Goodwood. An IGas land agent told a public meeting in Graffham that the first well would be at Baxter’s Copse on the edge of the village, but the specific location of the West Dean well was not revealed. Both sites would be within the South Downs National Park. The agent stated that IGas did not want to frack, and would drill a vertical borehole with no horizontal extensions. The well at Baxter’s Copse was drilled in the 1980s by Conoco, who discovered oil at the site but abandoned it because it was uncommercial. IGas state on their website that they are interested in shale and CBM, and were the operators of the Barton Moss site. Leafleting and a public meeting are planned in Graffham sometime in the near future – email info@frackfreesussex if you would like to get involved. The Infrastructure Bill debated by the House of Lords on 13th October, now includes an amendment by Baroness Kramer, the Liberal Democrat minister guiding the bill through the Lords, that permits the “passing any substance through, or putting any substance into, deep-level land” and gives “the right to leave deep-level land in a different condition from [that before] including by leaving any infrastructure or substance in the land”. "This amendment makes a mockery of the government’s repeated claims about Britain’s world-class fracking regulations. Far from toughening up rules, ministers are bending over backwards to put the interests of shale drillers before the safety of our environment and our climate." Very concerning news this evening for our friends at Kirdford and Wisborough Green, as Celtique Energie have now stated they will appeal the decision made by WSCC to refuse the planning application there. QUOTE (abstract): Friends of the Earth South East campaigner Brenda Pollack said: “This appeal will cast a dark shadow over the lives of local residents who have made it clear that they don’t want fracking to take place in their backyard. “There were clear and sound reasons to refuse this application, less than 500 metres from the South Downs national park – not least the impacts of extra traffic on a conservation area. The Westminster government has treated respondents to their public consultation on drilling for fracking under our land with utter disdain. Democracy anyone? 40,647 people and organisations responded, more than 99% opposed the idea. This "Consultation" was nothing more than a reprehensible, patronising exercise by those whom the electorate have empowered to legislate for us. It was designed simply to mollify and give the illusion of democracy. Anybody still have any scales in their eyes left to fall where obscenely lucrative vested interests are involved in governmental legislation? Hmmm? "We acknowledge the large number of responses against the proposal and the fact that the proposal has provided an opportunity for the public to voice their concerns and raise issues. "However the role of the consultation was to seek arguments and evidence to consider in developing the proposed policy. Whilst a wide range of arguments were raised and points covered, we did not identify any issues that persuaded us to change the basic form of the proposals. "Having carefully considered the consultation responses, we believe that the proposed policy remains the right approach to underground access and that no issues have been identified that would mean that our overall policy approach is not the best available solution. "We will therefore put before Parliament primary legislation to implement the policy proposals set out in the consultation paper. Parliament's scrutiny of the provisions will provide further opportunities for public engagement on the issues." SUSSEX FARMERS want to KEEP THEIR LAND RIGHTS! SUSSEX FARMERS WANT TO KEEP THEIR LAND RIGHTS! Today, the DECC announced that the government will ignore over 40,000 objections, including one by the National Farmers Union (NFU), in order to allow fracking under our homes and land through changes to the trespass law. This still has to go through the parliamentary process, so EMAIL YOUR MP TODAY... remember there's an election coming up?! One local farm owner told us "The DECC ignoring 40000+ objections in a public consultation has to be a breach of the legalities of a democracy." 'The consultation response from the Department of Energy and Climate Change (DECC) on fracking fails to properly tackle the issue of long-term liability leaving landowners at risk long after drilling has stopped, according to the Country Land and Business Association. “It is greatly concerning that there continues to be a lack of information from the Government regarding long term liability. No assurances have been given to land and property owners that they are fully protected from losses or claims for damages should issues arise." Yesterday (Sunday), one of our local residents spotted Celtique Energie's contractors working on the site... this is expressly forbidden within the planning conditions. WE NEED YOUR HELP. If you pass the site on a Sunday, and the contractors are working, please PHOTOGRAPH OR VIDEO IT, log the time and make a note of the nature of the work. Then report it directly to the Compliance and Enforcement department at West Sussex County Council (ideally by email asap, so there's a paper trail that can be logged, but also by phone to make sure your email has arrived!!). Please make sure you share the information and responses with us so we can collate them. AMAZING NEWS FOR SUSSEX- Fernhurst application REJECTED!! AMAZING NEWS FOR SUSSEX THIS MORNING!!!!! The application by Celtique Energy to drill at Fernhurst has been UNANIMOUSLY REFUSED by the South Downs National Park Planning Committee. Campaigners wept tears of relief and joy at this mornings decision. A Massive THANK YOU to everyone who objected to the application! MORE NEWS SOON!!! 1-landscape qualities ....the light at night and general appearance of the national park. 4- the applicant failed demonstrate that national need for oil and gas could not be met by locating elsewhere. ‘FFF is delighted that the SDNPA planning committee have turned down Celtique Energie's application for exploratory drilling at Nine Acre Copse. In rejecting this application they have not only taken the advice of their own planning officer and accepted the government's own confirmation that such development should only take place in a national park in exceptional circumstances but also listened to the over five and a half thousand people who have objected to this proposal (as opposed to the eleven who have expressed support of it). Clearly a national park is not the right place for a large-scale “industrial experiment” (Andrew Tyrie MP), and we are relieved to see that the SDNPA have upheld their objectives to protect the national park and the community within it. Right up until the last minute Celtique demonstrated their lack of respect for our community with their continued attempts to mislead both the public and the planning authorities with disingenuous and incorrect statements and material. We would like to thank all the organisations and individuals who have tirelessly campaigned for and contributed to our campaign – from Greenpeace, Friends of the Earth, the National Trust, the Woodland Trust, RSPB, CPRE, the South Downs Society to those who visit and love the national park and of course the residents of Fernhurst, Lynchmere and the surrounding area. 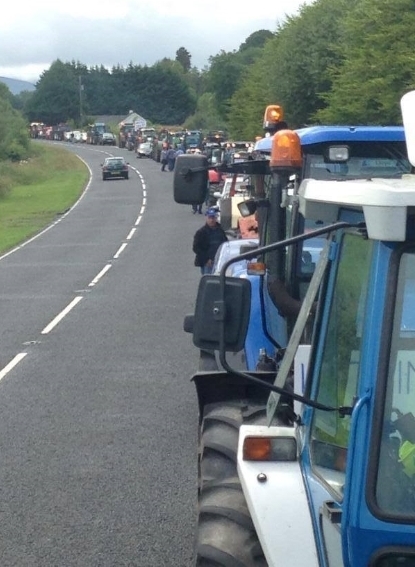 140 tractors on the anti-fracking tractor run to Belcoo! Irish farmers responded to the threat to their livelihood by organising an incredible Tractor Anti Fracking run from Belcoo community protection camp to Enniskillen on 3rd August 2014. Close to 140 vehicles took part in an amazing show of solidarity and support.